-- Cicero, 106 - 43 B.C. Today is the first day of Spring so I’d like to discuss school gardens. I always wanted to have a school garden, and I found the perfect place for it, but it never happened, mainly because I just didn’t have the time to add such an undertaking to my schedule of teaching more than five grade levels every year. So when I decided this year to volunteer at a local school, I jumped at the chance to work with the teacher who maintained the school garden there. There are so many benefits to having a school garden! For ELLs, especially those at lower levels of language proficiency, working in a school garden means they can participate just as much as other students because the tasks are hands-on and visual. And if you plant some crops that are used in the cultures of your ELLs, it shows that you value those cultures and gives those students and their families a chance to share their knowledge and make them feel a part of the school community. Read on to find out: a) why a school garden is a good thing, b) resources for creating and maintaining a school garden, and c) where you can obtain funding for your own school garden. 1) Students learn where their food comes from – for students in cities who aren’t familiar with farming, this can be very illuminating. 2) Students interact with nature by spending time outdoors and seeing insects and worms in the soil and as the plants grow. 3) Students learn teamwork because they have to work cooperatively to make the garden a success and students who don’t normally work with each other can be grouped together to develop their social skills. 4) Students learn patience because once seeds or seedlings are planted, they have to wait for them to grow and students can’t force the plants to sprout faster than nature intended. 5) Students learn math and science concepts – they are so many tie-ins to curricula for students of all ages it’s impossible to list them all here but recording observations, formulating hypotheses, measuring units, learning about nutrition, graphing results and calculating percentages are a few of them. 6) Students can do writing activities such as writing poetry, writing a description of a plant, writing how-to pieces about creating the garden, writing personal narratives about their experience with the garden, comparing and contrasting two different vegetables, writing about what a vegetable or herb tastes like, creating a recipe book for the foods that were grown, creating timelines about the growing process, and writing letters about their school garden. 7) Students can develop research skills by searching for information about school gardens, by finding out which crops are best suited to their region of the country, and by reading about how particular vegetables and herbs are used in other cultures. 8) Students can learn about geography and other cultures by planting vegetables and herbs cultivated in other countries. 9) Students from different ethnic backgrounds can share their cultures when crops that are common in their cuisines are cultivated, and this can also help foster appreciation for people from those cultures. 10) Students can develop multimedia skills by creating videos, podcasts, photo exhibits, posters, and oral presentations about their school garden. 11) The student-parent (or guardian) connection can be deepened when the families of the students working in the garden are involved – if some families have gardening experience they can help create and maintain the garden, families from immigrant and refugee backgrounds can share their knowledge of gardening and grow “ethnic” foods in part of the garden, families can show how to cook various vegetables and use herbs, and families can be invited to a feast with the students after harvesting the food. * U.S. Department of Agriculture: Information an all aspects, from planning through sustaining a school garden program. * Slow Food USA: Research-based rationale for implementing a school garden. * KidsGardening: All about designing, starting, and maintaining a school garden. * Growing Minds: Resources for starting a school garden, related lesson plans based on the Common Core State Standards, and information on applying for a grant if you are working in their region. * Let's Move: A checklist for getting started with a school garden. * Western Growers Foundation Collective School Garden Network: Information on the benefits of school gardens, how to plan and fund a school garden, planting a school garden, teaching with a school garden, and harvesting and eating the produce from an edible school garden; also includes grant opportunities for schools in Arizona and California. * Good, Clean and Fair School Garden Curriculum, from Slow Food USA: Lessons for all elementary and secondary students that align with Common Core and Next Generation Science Standards. * Bonnie Plants 3rd Grade Cabbage Program: Apply by February 15th. * Captain Planet ecoSolution Grants: Two cycles: a) Opens January 16th and closes July 15th; b) Opens July 16th and closes January 15th. * Project Learning Tree Green Works Grants: Deadline Sept 30th. 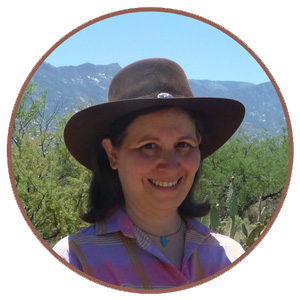 * Wild Ones Lorrie Otto Seeds for Education Grant: Deadline October 15th. * From Community Groundworks: Links to 18 grant opportunities plus links to resources about implementing school gardens. * From Slow Food USA: Links to 19 organizations that fund school gardens. 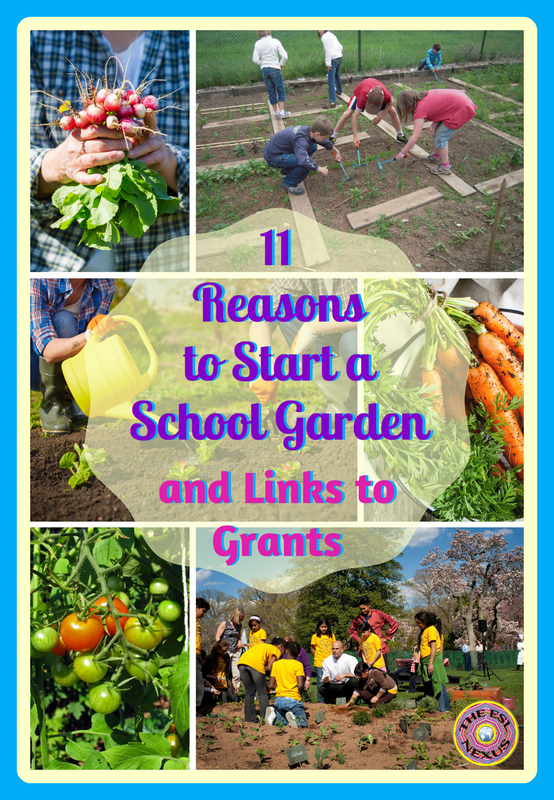 * From KidsGardening: Links to 20 grants that fund school gardens. Having worked as an agricultural extension agent in the Peace Corps, I know well the joys of planting something and watching it grow. 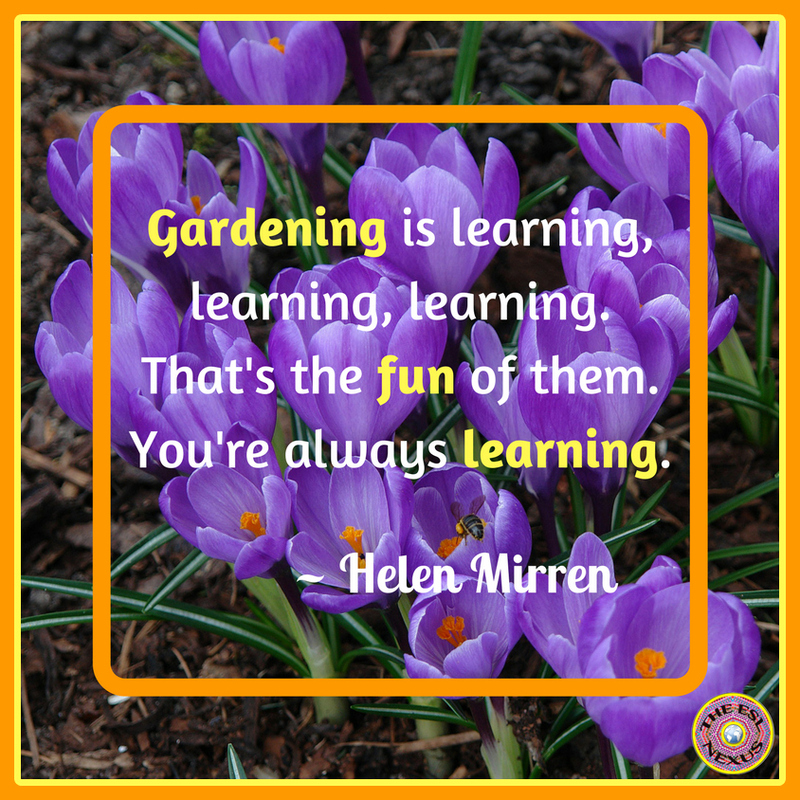 And although a school garden involves a lot of initial work, the benefits it brings to ELLs and all students is, as Helen Mirren affirms, certainly worth it. Do you have a school garden? Please share how you utilize it in the Comment section below.